Art styles are a pretty big deal among Zelda fans, but, while I have touched on the subject before in various articles and videos, I’ve never really dedicated an entire article to the topic. Until now that is. I’ve made no secret in the past of my general disappointment with Twilight Princess — I don’t hate the game by any means, but it did disappoint me when compared to most other Zelda games — and one of the biggest reasons for that was its art style. Now, a lot of people forget this but Twilight Princess did not have full-on realism; plenty of the aspects of past games’ anime style still show through in Twilight Princess, and there’s still familiar elements in the art style. But I don’t think anyone’s going to argue that it’s not the closest thing that exists right now to a realistic Zelda game. “So what? The real world’s made of realism!” you might be yelling at your monitor. So, what is wrong with realism in the Zelda series? One of the arguments I’ve always made is that Zelda itself isn’t realistic; it’s a whimsical fantasy series with a lot of quirky elements. It’s kid-friendly, light-hearted, and stylized. 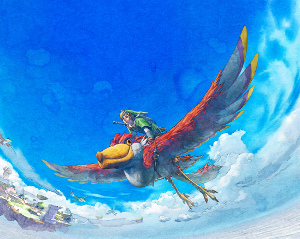 It’s been that way since day one, with looks ranging from the stylized drawings of the early 2D games, the anime-inspired look of the N64 titles and Skyward Sword, and the cartoon style of The Wind Waker and the DS games. This is the tone and style that I identify the series with. Twilight Princess is the only game to break this mold — some would say Majora’s Mask did too, but I’ll get to that later — and while I wouldn’t mind a non-traditional title here and there, the idea that future games should use this style bothers me. However, there’s certainly room for arguments against this notion of mine. For example: Realism can be whimsical too. For all the dark drama or horror live-action movies, you also have silly comedies and, well, fantasy movies! Twilight Princess isn’t automatically less whimsical because of its heightened realism, but rather because of its darker tone and duller, minimally colorful world. If there were a realistic Zelda game that did not drop the colors and make things as serious for as much of the game, there’s a good chance I wouldn’t regard it like I do Twilight Princess. I have a bigger point however. Rather than sticking to this whimsy business, which you may or may not disagree with, let me tackle this argument from a completely different angle: I think the less-realistic styles are more inherently Zelda and more healthy for the series because they are sometimes more powerful but more importantly, more versatile. What is stylization? To draw or depict something in a stylized way, as opposed to realistically, means to warp or twist elements according to some style or convention. At a more basic level, what you are doing is exaggerating elements in order to create a modified effect. At its worst, this looks… terrible. At its best, it creates a unique look where all the most important elements are brought to the fore; exaggeration often means augmentation. Exaggerating roundness and softness makes something cuter; drawing out shadows makes something fearsome or imposing. Brighter colors make things happier, while grays make it more serious or melancholy. What better tool could there be for depicting a game’s distinct atmosphere and drama than stylization? Let’s take Majora’s Mask as an example. This game was dark, at least compared to the average Zelda title, so you’d think it would fit in right next to Twilight Princess as a game that shunned whimsy. But it was actually very stylized and still a whimsical game; it continued the anime style of Ocarina of Time and introduced many other fantastical and strange designs to its world, right down (up?) to the iconic moon in the sky, which was terrifying and yet unusual and even silly. You can feel the resulting atmosphere — sometimes eerie or filled with dread, always strange — throughout the entire game. I don’t bring this up to continue my whimsy argument, but rather I’m making the point that Majora’s Mask took unrealistic and silly elements and used them to create a more powerful and nuanced storyline and world than Twilight Princess did by shunning those aspects. It did this by exaggerating key elements, making them less realistic but all the more powerful for being so. The dread that’s present at multiple points in Majora’s Mask is entirely due to the game’s uncanny style. Uncanny refers to something that is alien yet familiar. This cognitive dissonance — holding two or more conflicting thoughts or considerations — causes extreme discomfort. Typically if something is uncanny it will repulse the observer without them being able to identify why. It’s this sense of the unknown, of uncertain and incomprehensible repulsiveness or danger, that creates dread and tension. If someone were to be simply attacked by something obviously dangerous — perhaps a beast drenched in blood and sporting claws — then it simply triggers the fight or flight response. But if you can’t identify the threat but feel that something is inherently wrong, then it creates anxiety and dread. This is present all throughout Majora’s Mask, and even in a few other Zelda games. Is the Dead Hand in Ocarina of Time, nearly universally considered the most disturbing Zelda beastie, disturbing because it pops out of the ground and tries to nom on your head? Or is it disturbing because of its malformed body, its growth-stunted not-hands, its bizarrely elongated neck, and all-too-human face? 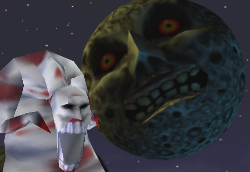 How about the moon in Majora’s Mask? Aside from people saying it’s going to fall, you have no reason to fear it… or do you? Its appearance is uncanny; it’s both a traditional moon and a face. Neither are things to fear on their own, but together they are uncanny. And there are many other cases of the uncanny throughout Majora’s Mask. The uncanny is the exaggeration or warping of what’s normal to create a recognizable yet alien thing. It occurs through the same means stylization does; it is stylization. Even though the uncanny occurs in real-life as well as realistic fiction, it is always through exaggeration or manipulation of what’s familiar, so it’s still a bit of style put to something that is otherwise realistic. Of course the uncanny is just one example of how to use exaggerations to create less-realistic but more effective moments. To name a few other ways… How about using unrealistic faces to exaggerate the emotion the characters feel during dramatic moments? You could make everything cutesy, so that when the villain destroys things or hurts people it seems particularly atrocious and makes the villain more effective. Or on a similar note, give each character exaggerated but appealing traits that make them more visually appealing so the player becomes more interested in the character right away from the visuals, before getting to know the character more later. Some of these have been done to a greater or lesser degree in Zelda games, and some have yet to be tried out, but they’re all good examples of ways you can use exaggerations to create more powerful effects in emotion, atmosphere, and impact, than you can without those exaggerations. Perhaps sometimes a more muted storyline is for the best, and impact from exaggerations isn’t needed and would indeed damage the tone of the game. But that’s never really been Zelda. 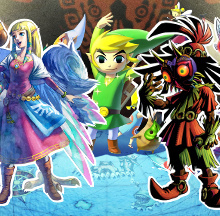 Zelda’s always had wild and fantastic character, foes, and settings. It’s extremely varied, and that brings me to the other point about unrealistic art styles: They’re more versatile. In a visually realistic work, if you want to give it a sense of anything other than “your everyday life”, you need to rely on other things, like events, audio, and themes, in order to give it its own tone or atmosphere. With an unrealistic work, you can do this with the visuals either instead of those things, or alongside them. Perhaps those other things are more important when you get down to it, but we’re discussing art style right now, and either way, adding another layer that augments a story’s distinct feel on top of the more important aspects can only help, not harm. The series is varied, from game to game. Each game has its own style, its own quirks and objects of interest. As a result, it best works for the series to have a large variety of styles. And less-realistic styles are more effective for this because they’re more effective in and of themselves. If stylized visuals didn’t augment or enhance anything, then using an unrealistic art style would be the same as using a realistic style; you’d have to rely on other elements to convey the nuances of the story and world. It’s because of the exaggerations in unrealistic art styles and how those exaggerations enhance certain aspects that these styles are more varied: As they augment individual elements of the game, they set themselves apart from each other more than they could otherwise, and they enhance each individual game in a unique way that helps all of the games stand apart from one another. If the series were to anchor down with one style, it would lose its variety. The Zelda series has always been dynamic when it comes to art style; Nintendo crafts the visuals to fit the style of each game. And whether this goes unnoticed or not, it is there and it has effected the Zelda games we’ve seen and helped to make them what they are. Without a variety of styles, the Zelda games would feel more samey, and their individual worlds and stories would feel less distinct, less new and unique. If versatility is so important to the series, if I claim that limiting the styles is so bad, then how can I justify the series limiting itself only to unrealistic styles? If whimsy is possible with realism — as the comedy and fantasy films prove — then how can I suggest it as an argument against realistic Zelda games? I don’t know if I have a satisfying answer. It’s definitely a hole in my argument. All I can really say is this: If it’s a question of which category of style should become the norm for the series — exaggerated styles that defy realism in favor of other things, or a realistic and lifelike look — then I think it should unquestionably be the unrealistic ones, because while that limits the series from using completely realistic visuals, it does allow for more variety than realism does and best preserves the variety that the series needs. And even if we’re going to use both, again it needs to be said that it’s impossible to create artistic distinctness between games that have total realism unless you use completely different elements, so while it’d be fine to see more realistic Zelda games (as there are several of most of the other styles), they should always be limited, because it’s still only one style and the series works best when it uses many styles for different games. As for the continued use of realistic or more-realistic styles in Zelda games, regardless of what capacity they’re used in, all I ask is that Nintendo does a lot more with it next time. 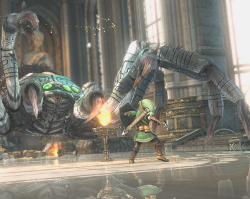 Artistically, Twilight Princess was a limited game. It wasn’t completely realistic, but it made very little use of its exaggerated elements except perhaps for the Twilight Realm denizens, so it might as well have been. And even if it had been totally realistic, it still didn’t make much use of other elements to make itself feel unique. 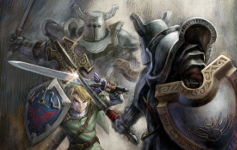 In many ways Twilight Princess depicted a nearly-generic medieval world, depriving itself of the distinctness that other Zelda games have had. It was in many ways muted and did not possess the energy, whimsy, or general fantasy that the series is known for. None of these are problems that need to or should be present in a future realistic Zelda game. If Nintendo revisits the realism, they should not use such a basic version of it; there are plenty of ways of using realism that work well for the Zelda series. Nintendo only needs to put more thought and effort into it. Twilight Princess is the best-selling Zelda game, so maybe in the end more people liked how it did things. But its sales could be due to other factors, and either way these are my personal feelings and my justifications for them. I definitely don’t think Twilight Princess is anything close to a go-to example of how to create an artistically interesting game, and I think in a number of ways it has the dullest art of any Zelda game. Regardless of its sales, it still didn’t deliver like other games did, and I hope that if Nintendo does decide to use this style more in the future, they do the right things with it and use it in the right amounts.